Chetham’s educates the Choristers of Manchester Cathedral. Boys and girls join the friendly group of choristers between the ages of 8-10, and usually continue singing with the choir until around the age of 13. Potential choristers do not need any prior experience to audition; we’re looking for children who enjoy singing and being part of a close-knit team and who, with their parents, will commit to a demanding but immensely rewarding schedule. Life as a Chorister at Manchester Cathedral and Chetham’s is a great opportunity, highly rewarding and lots of fun. It helps children to develop important social skills as part of a totally committed team, working closely with peers and adults in pursuit of excellence. All choristers are day or boarding pupils in Chetham’s Lower School, and enjoy an excellent musical and academic education in addition to first-class musical training from the Cathedral’s staff. Choristers attend rehearsals in the Cathedral where they sing for weekly services and special events. Concerts, special services and broadcasts on both radio and television form a regular part of a Chorister’s experience. We are very aware that our Choristers have a busy schedule and work hard to make their lives as easy as possible. The majority of the Choristers’ schedule fits in with the regular School day. They attend lessons and most practice sessions with the other Juniors, timetabled around rehearsals at the Cathedral. They have individual music lessons, and may be taught as beginners if they do not already play an instrument when they come to Chetham’s . Homework sessions are also built into the Choristers’ school day, helping to ensure that they can enjoy free time at home following Evensong. 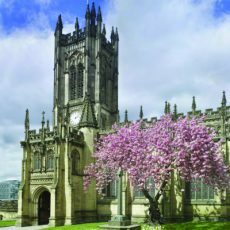 Chorister auditions and funding are led by Manchester Cathedral. Interested families are invited to meet the Cathedral music team at regular Be A Chorister For A Day events visiting the School and Cathedral, or through Manchester Children’s Choir, which holds free, non-auditioned sessions every Saturday morning at the Cathedral. For more information on Choristerships, contact the Master of Choristers, Christopher Stokes, at Manchester Cathedral. Chetham’s is a member of the Choir Schools’ Association. The unique musical environment in which choristers are based, and the opportunity to study an instrument with Chetham’s staff, gives them a strong foundation from which to continue as musicians when they reach Year 8/9. Our arrangements mean that choristers may, aged 13, choose to re-audition for the Cathedral choir, or to apply to Chetham’s as instrumentalists or first study singers outside the Cathedral Music programme. Girls, and boys whose voices are ready to sing lower parts, who remain part of the Cathedral become young Choral scholars, performing alongside professional Lay Clerks. Choristers aged 13+ continue to enjoy a bespoke timetable integrating their rehearsals at the Cathedral with a musical and academic education, including a second instrumental study at the School, and will contribute to the School’s Chamber Choirs and other vocal ensembles. Choristers who are successful at re-audition will enjoy the same fee arrangements as younger choristers, up to Year 11. Choristers may alternatively audition as First-Study instrumentalists or singers when they reach Year 8/9, and join the School full time. They will then usually be eligible for funding through the MDS scheme.